The final collection graphic novel of the greatest love story ever told features a forward from Rob Halford of Judas Priest, twenty short stories about the domestic life of “Henry” and “Glenn” as well as their neighbors “Daryl” and “John.” Digging beneath Glenn’s bricks in the front yard, Henry uncovers Glenn’s mother, freshly unearthed, moves in with him and Henry. Without giving too much away, [spoiler alert: Glenn has mommy issues] Glenn’s mommy issues come to the surface as she critiques his art, replaces his wardrobe, scrubs their dungeon, and recalls his childhood. Glenn tries to sell his signature to a UPS driver, takes a punch, and has some daydreaming adventures with a plunger. Henry, “a loud guy with a good work ethic,” shows his darker side and indifference to a fan as he drinks black coffee and bonds with Glenn over their distaste for their own bands; two men who suffer best alone together. 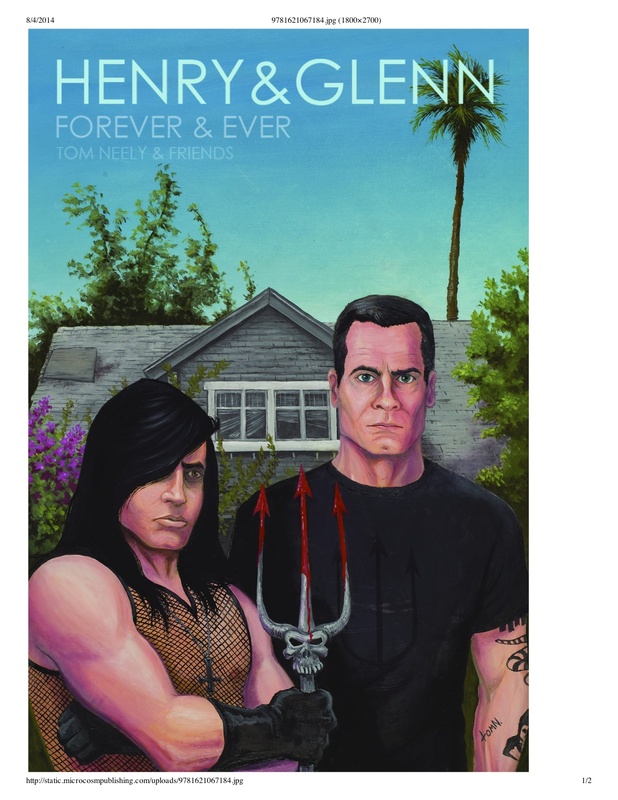 Henry and Glenn go to therapy together, battle an evil cult in the forest, and profess their love between dealing with repeated jealousy and normal relationship problems while trying to figure out if their soft-rocking neighbors are actually Dungeons and Dragons played Satanists. It’s a true testament to the power of love to overcome even the biggest, manliest egos of our time. The book also features dozens of pin up art and full color covers from the original serialized series. are, the bigger the laugh. More than a political statement.